This is a duplication of today’s newsletter. If you are subscribed to both the blog and newsletter, you will unavoidably get this same information twice; my apologies. The first day of the New Year here is sunny and cold, no—freezing, to be exact; at 32° F. and there are feelings of optimism covering the earth, permeating the mind and hearts of those open to these plentiful vibes. The numerology for the 2015 year totals to an 8 and this is a vibration associated with material and business success and increases in prosperity. Back to a personal note now, I’ve just (in this past week since Christmas) moved into a cute and cozy little apartment that has the appearance of being its own little house—a one level end unit. It is a quiet little rental community here—individual buildings spread apart on the side of a hill surrounded by wide open grassy areas bordered wooded areas and trees kindly left by the 1970 builders. Trees remain in and around the campus giving the place the feel of a campground. I’ve yet to hear either of my neighbors—both elderly females in a one bedroom unit like me. In comparison to the living conditions experienced since moving from the mountains, this is heaven and appreciated fully as “heavenly is-ness” by me. I am asking, through my connection with Divine Mind today, for a few predictions for the New Year. (Family came to visit last evening, New Year’s Eve, and we went to dinner. I’d been so tired and quite relaxed after a series of days of moving and organizing things in the new apartment that my meditation was very short and sweet and I fell into deep and restful sleep just after midnight. Therefore, no list of predictions as in the past years, but for a few minor ones which are quite personal. However, now I will ask for several general predictors for 2015 using my tarot cards which I planned to unpack today anyway. So let me get those out and give a good shuffle and draw two. Ten of Swords and Queen of Cups – an interesting combo here and one insight is that this will be the year of “the woman” or the “yin vibes” (intuition, gentleness, compassion, empathy) will receive it’s “due”, if you will, becoming more recognized, appreciated and valued. The bleeding stops (if you will) this year as well. Wounds of the past—whether financial, emotional, or material—begin to heal. With any deep wound, the first thing we need to do is to “stop the bleeding” and that’s the theme for 2015 as well. Excessive dependencies (bleeding) will stop and self-acceptance and courage evolve. Self-appreciation and giving one’s self credit helps to cauterize wounds of the past resulting in greater emotional control and a finer insight into the motivations and thinking of others. Again the feeling of increased intuition and optimism comes through these cards—the worst is over so let the healing commence (in whichever way it occurs)– financially, emotionally, spiritually and physically. Even if the reorganizing and healing results in what appears to be (10 of Swords) painful or difficult in some way, the ability to hold the intuitive end emphatic view (Queen of Cups) involving the “stopping of the bleeding” in some way will overcome that appearance. And a calm, peaceful, deeper-knowing sense of things rules overall (Queen of Cups). That saying “it is not circumstances, it is the view that one takes of those circumstances” will be the key to success in 2015. There is a true “death of the old cycle” that really feels very clear; thus the optimism. 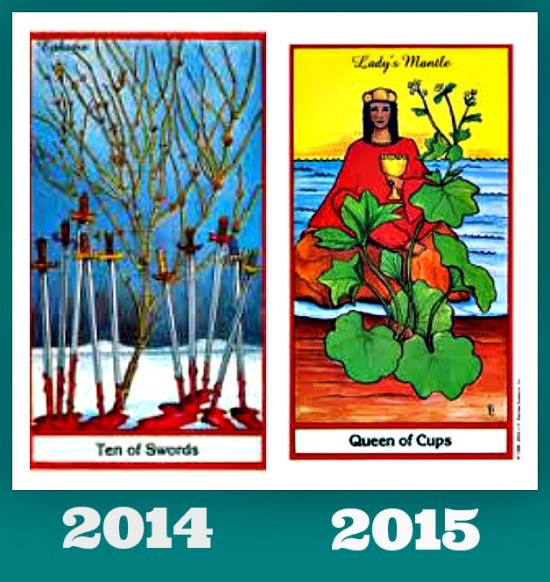 It is as if the Ten of Swords represents 2014 and the Queen of Cups, 2015. The days of too much worrying and over-thinking and painful analysis are over (generally speaking) and it becomes much easier now as we move into 2015 to embrace trust and faith. It is through acceptance, trust and faith that the “light at the end of the tunnel” is seen and that describes the transition point and energy shift between the calendar change from 2014 to 2015 or from a 7 year to an 8 year. On more mundane levels, issues of breathing or doing breath work help to ease the transition and there may be more interest in doing breath work or engaging in breathing exercises for health and meditative purposes. Venus is rising in the sky now and the Queen of Cups is traditionally connected to this planet. The Queen of Cups is the yin energy relating to a strong spiritual base. Love vibrations are associated with this predictive energy as well and it feels right to mention that feelings of love for humanity and life itself will rise within us in 2015. Attainment of spiritual power and higher consciousness is on tap for us in 2015. In business matters, simple devotion to the career involving persistence (don’t give up the ship!) will result in success this year. I also feel that in the summertime of 2015 there will be great concern with water, the waters—perhaps oceans. Keep an eye on the oceans in June and July for something significant. Additionally, people may want to visit their local area beaches or travel to the shores of their country for vacation or recreation more so than in other years. I feel the healing energy of water will be paramount in some way in the summer months—especially late summer. 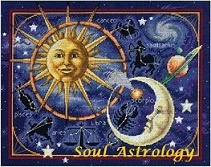 News of space or some finding or discovery about the planets or solar system occurs this year which changes people’s view of their life and the cosmos. Some type of space travel by the business sector occurs as well. Also something about Mars makes the news this year. People seem more willing to take risks or make bigger purchases—again, the level of optimism helps the economy generally. April brings some type of big news that affects us all on a global level and it has a feeling of technology that comes with it. So these are a few psychic predictions for 2015. This is a year in which you will know who you are—not just believe but truly know. Last year prepared you for this. Dedication: May all living beings, without exception, have their needs met abundantly and experience the liberation that contented happiness provides.